Are you investing time, money and resources into Instagram, and only getting a handful of Likes and followers in return? While comments, Likes and new followers are great, they don’t always equate to new customers. Although Instagram is mostly known as a great tool for branding and engagement, it can also be a direct source of new customers. The challenge is figuring out how to turn casual followers into leads and buyers. If you’ve been struggling to convert on Instagram, here are eight reasons your followers aren’t buying. Nothing turns people off more than the pushy salesperson, especially on social media. Since its inception, Instagram has placed a strict focus on content, creativity and capturing memorable moments. Posts about your latest specials and deals don’t always fit into that vision. If you’re constantly selling on your Instagram page and not offering anything of value, there’s a good chance your followers notice and are completely turned off. Our Q3 2016 Index found that posting too many promotional messages is the No. 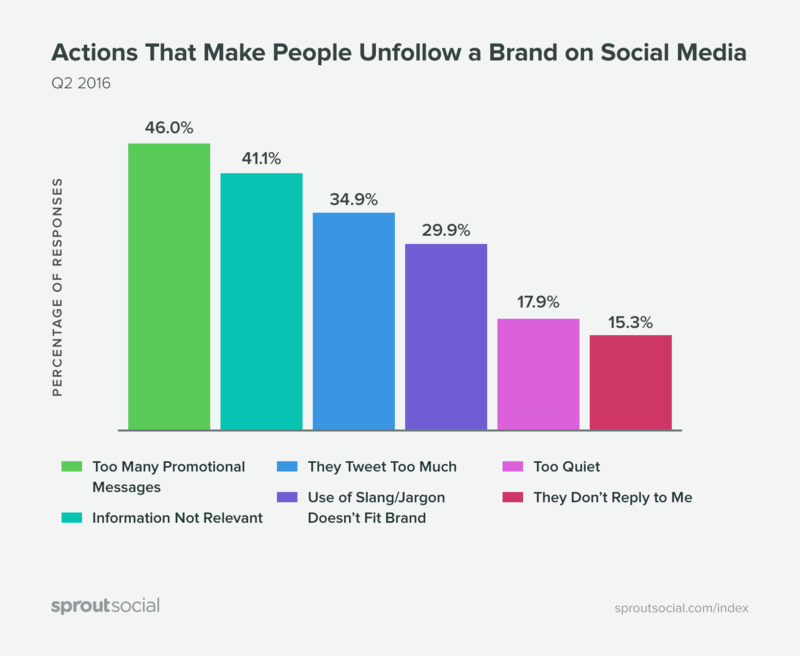 1 reason people unfollow brands on social media. You can turn things around by sharing less self-serving content. Think about photo and video ideas that your audience would find useful or entertaining. You can even mix in your products and services to get the best of both worlds. For instance, the BulletJournal Instagram account regrams pictures of how customers use their product instead of solely generic images. This is a great way to demonstrate the value of your product without being overly promotional. We just told you not to hard-sell, now we’re saying you’re not promoting enough. What’s the deal? While posting too much promotional content can definitely be a turn off, some marketers fall on the other end of the spectrum and never post any type of marketing message. Ideally, you want to fall somewhere in the middle so that you’re giving value but also have the opportunity to get something in return when you need to. In his popular book Jab, Jab, Jab, Right Hook, entrepreneur Gary Vaynerchuk recommends the process of give, give, give and then ask. What that means is you constantly give to your audience with no expectation of anything in return. Then when you actually do have something special to promote, you can ask without the fear of being spammy. There’s no problem with being promotional or asking for something from your followers. The problem is when you start asking more frequently than you give value. BestSelfCo, a company that sells products to motivate and improve productivity, is an excellent example of a company that has found a good balance. They share a healthy mix of promotional and non-promotional posts so that it’s not overbearing. Here’s a look at six posts in a row, only two of which feature their products. As you can see, when you regularly share non-promotional posts, featuring your products every now and then isn’t disruptive at all. In fact, it helps your promotional posts stand out. Let’s say you’ve found the right mix of promotional and non-promotional content and you’re able to get Instagram users to leave the app and go to your website, signup page or elsewhere. The next challenge is getting them to convert. If your Instagram traffic isn’t converting, there could be a chance that you’re not sending them to the right place. Instagram gives you one clickable link in your bio and that’s it. You can’t add links to your captions, in replies or anywhere else. Most brands default to just using their website’s home page here, but that’s not always the best option. And here’s why. A link to your home page might be great for people who have no idea what your company does and just want to check out your website. But that’s extremely broad and general. It doesn’t account for what people on Instagram want to see from your brand and it doesn’t give them any clue for what to do once they click through. Instead, get strategic with where you’re sending your Instagram traffic. For instance, you can use the link to promote your latest blog post, YouTube video or other content. Post a photo or video on you Instagram and direct people to click the link in your bio to read the full story. Here’s an example from Mashable. They made a post featuring an eye catching image that referenced an old blog post. Notice they direct people to go to the link in their bio for more information. You could also send traffic to a landing page specifically made for people visiting from Instagram. Think about what your audience on Instagram wants to see and craft your copy and lead magnet around that. A lead magnet is simply something you’re giving away for free in exchange for the person’s email address or other information. 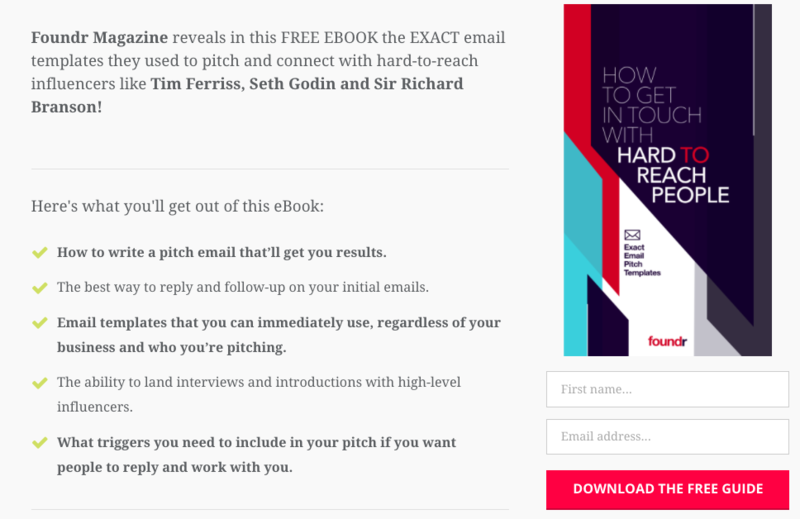 Foundr Magazine links to a lead magnet for an email swipe file in their bio. When people click on the link, they’re taken to a landing page where they have to enter in their contact information and become leads Foundr can pursue. Whether you’re sending traffic to your home page or a special landing page, it’s a good idea to add some context in your bio to guide people along. It can be as simple as a few words to explain what people should do on your site, or a brief description of what you’re linking to like Foundr did. To go along with the previous tip, you need to make sure your website is fully optimized for mobile devices. This is particularly important for ecommerce or software companies that are trying to get people to make a purchase or signup for a trial. Your signup and checkout process needs to work just as well on a mobile device as it does on desktop since most Instagram users access the app through their phone or tablet. You can start by plugging your website into Google’s mobile friendly tester. Passing this test in the minimum you can do. It simply shows whether or not your website is “easy to use” on a mobile device. It doesn’t necessarily mean everything functions as it should. To go a step further, you should add your site in Google Search Console (GSC). This is Google’s dashboard that helps website owners get a better understanding of how their site is performing in the search engine as well as any issues that could affect your rankings. GSC has a built in mobile usability tester that gives you a more in depth look into issues your website has on mobile devices. The last line of defense is to actually go through your site on a mobile device as if you were someone visiting from Instagram. Test out any add to cart buttons, the signup process and anything else that could potentially cause problems for your audience. Remember what we said about posting the right type of content for your audience? If you’re not tracking, you’ll have no idea what that content looks like. 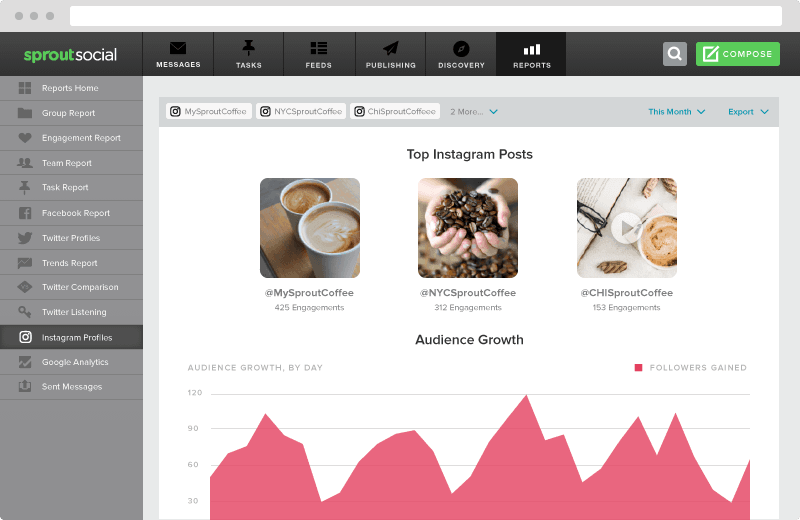 While you could use Instagram’s built in analytics, most businesses require something more in depth. Sprout’s Instagram post analytics features give you in depth stats on your best performing content right down to which hashtags give you the most engagement. Staying on top of your stats will help you make smarter decisions on what’s working and what could be improved on. There’s no need to guess or make assumptions. Use data to find out what type of content your audience wants to see from you. 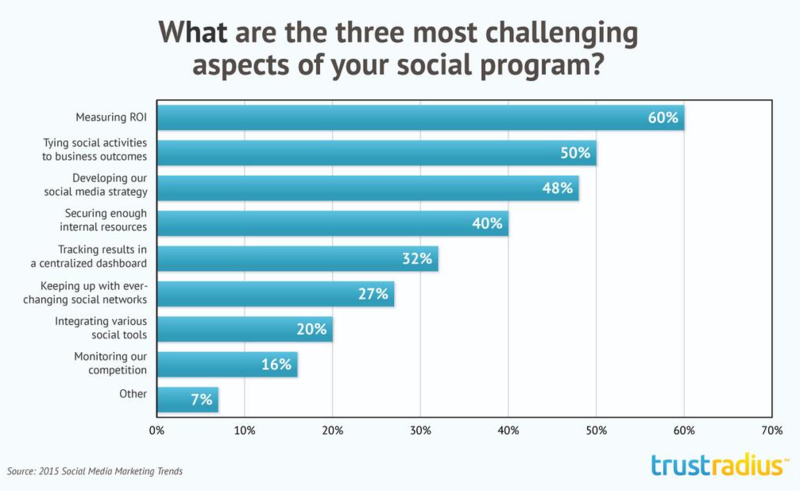 In a survey from Trust Radius, 48% of businesses reported that developing a social media strategy was their biggest challenge on social. 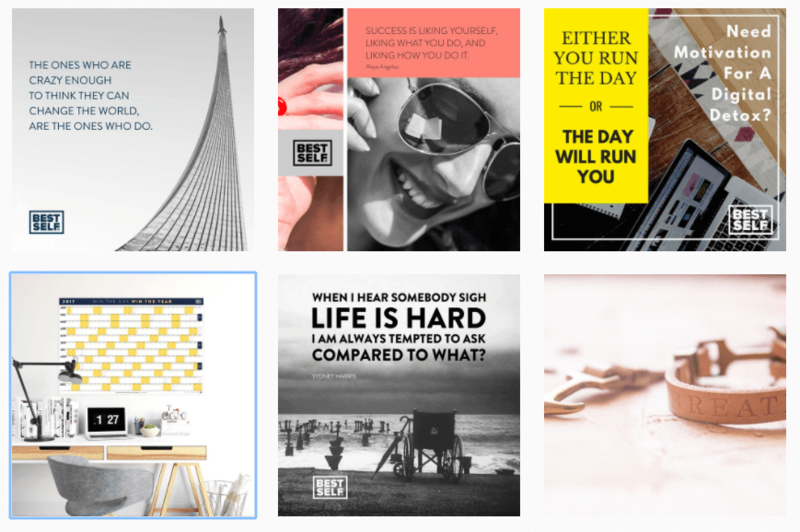 While you might be able to get away with just winging it for a bit, eventually not having a defined or thought out Instagram marketing strategy is going to hurt your ability to sell. One of the main benefits of having a strategy in place is it allows you to build out a sales funnel for Instagram. Sending people to your home page and just hoping for the best leaves room for missed opportunities. While you’ll get the occasional visitor that converts on their first time, most people require a little more convincing before they trust you enough to become a customer. With a sales funnel in place, you have the opportunity to nurture leads and warm them up for the sale. Check out our guide on how to create an Instagram marketing strategy to get started. Instagram isn’t the same as Facebook, Twitter or any other network so you have to account for that in the way you approach it. For one, there’s the whole no clickable links issue we mentioned earlier. That alone makes it significantly different from what most marketers are used to. Instead of strictly looking at Instagram as a way to directly result in sales, think of it from a branding perspective. It’s a way to stay in front of your audience and be discovered by new ones. But ultimately your goal should be to get that audience off of Instagram and onto your email list or another platform where they can be converted into a customer or lead. Instagram has made it clear that they’re not afraid to release new features. In 2016 the company released a wide range of updates from comment moderation to saved drafts and Instagram Stories. While these features are primarily to make the app more enjoyable for users, they also present new opportunities for brands as well. If you’re still using Instagram the same way you were in 2015, it’s time to update take advantage of all the new features available. 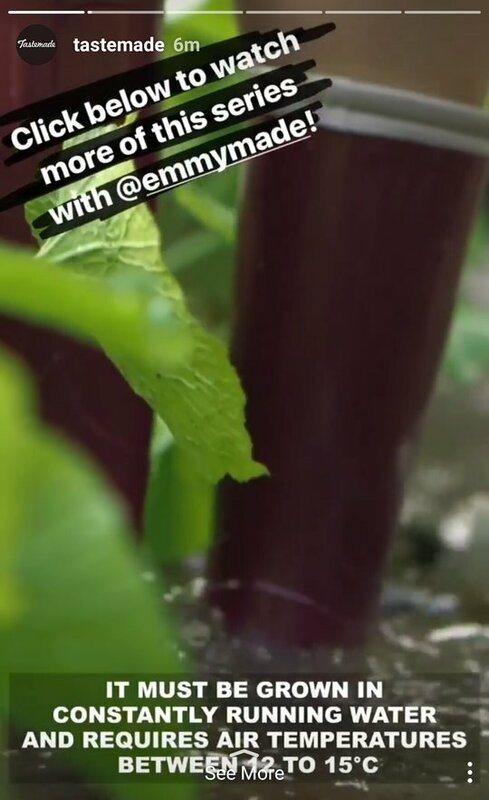 We’ve already seen brands like Tastemade jump on board Instagram Stories when many marketers were hesitant because they weren’t sure if it’d be able to go head to head with Snapchat. Just like with any other social network, as they release new features and make changes, you should test it out and think of ways to use it to your advantage. Ready to Get More Buyers on Instagram? If you’ve been struggling to turn Instagram followers into buyers, hopefully the tips above will give you the boost you need. Focus on providing value, balancing promotional and non-promotional content and developing an Instagram marketing strategy. Over time you’ll start to reap the rewards of your efforts and go beyond getting Likes and followers to gaining leads and customers on Instagram.